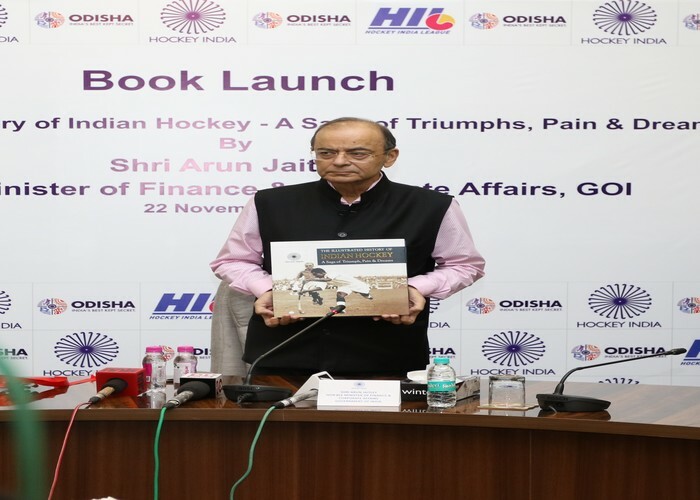 Delhi, November 22 2018: Leading into the much-awaited Odisha Men’s Hockey World Cup Bhubaneswar 2018, Hockey India on Thursday released a curated coffee table book titled ‘The Illustrated History of Indian Hockey: A Saga of Triumph, Pain and Dreams’ capturing the glorious journey of one of India’s most celebrated sports. Shri Arun Jaitley, Hon’ble Minister of Finance and Corporate Affairs, released the book alongside FIH & IOA President Dr. Narinder Dhruv Batra, Hockey India President Mohd. Mushtaque Ahmad, Hockey India Secretary General Mr. Rajinder Singh and Hockey India CEO Ms. Elena Norman, the book publishers and editors as well as prominent and legendary Indian Hockey players. “I believe this is the best occasion to launch a book which documents the illustrious history of Indian Hockey. We are less than a week away from the Odisha Hockey Men’s World Cup and it was essential for a nation with such a rich history in the sport to be able to read and relive it’s glorious past.” saidPresident FIH and IOA, Dr. Narinder Dhruv Batra. “It’s a matter of great pride for us to document and publish India’s illustrious journey with a sport which goes back to over a century of its existence in India. With the Odisha Hockey Men’s World Cup Bhubaneswar 2018 just around the corner, there would have been no better time than this to release this book for all hockey fans and sporting enthusiasts. I would like to congratulate the authors, publishers and our team for the wonderful compilation of this book.” said Hockey India President, Mohd. Mushtaque Ahmad. The first-of-its-kind book is enriched with a huge reservoir of historical and other interesting hockey trivia, for readers. The book turns back the clock and documents to India’s performance in the sportsince the 1928 Olympics and other key international events providing exhaustive, in-depth information including the World Cups, Asian Games and Commonwealth Games. With over a century of its existence in India, hockey has seen both success and pain. Hockey has a strong emotional connect with our country. This book traces back to the golden era of hockey where we emerged as the first ‘Super-Power of the game’. It is a literary destination for all things in hockey including highlights of Women’s and Junior Hockey national team’s performances laced with interesting statistics, snippets and factoids. A ‘collectors-item’, the book is an attempt to rekindle people’s interest in the sport and chronicle the glorious moments marking the advent and progress of Hockey in India.